I will tell you that what I often seek out in reading accounts of how other artists—composers, visual artists, novelists, essayists and especially librettists and poets—make what they make and how they make it: in short, I seek their shop talk: what kinds of pencils, pens, notebooks, and all manner of other media. And I want to know what they listen to or watch (if they do) while they work. These are the telling details: this is the most resourceful information. 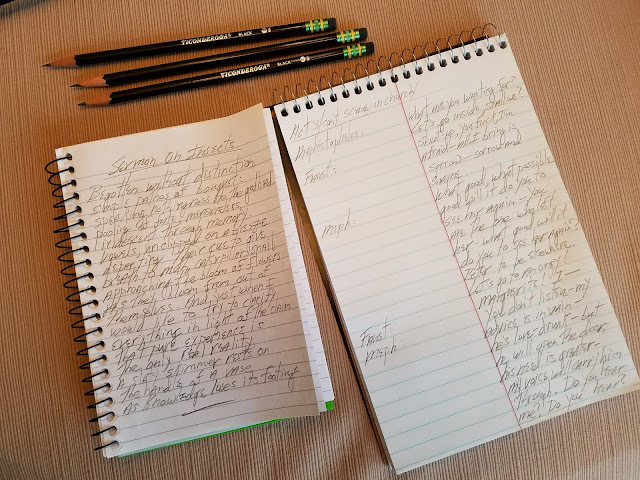 For me, every project—whether it be a libretto, play or poem—undergoes three distinct stages: the scheming or the planning; the writing of actual notes; and the editing. With every piece, no matter its pulse or length, the first thing I do is to map out its itinerary, from the simplest, worm’s-eye view to more detailed questions: what are the textures and lines that form the work’s economy. Perhaps it develops linearly or vertically. Perhaps there will be points of dense saturations—and perhaps those will be offset by sections of zoomed-in simplicity: sparse words with lots of white space, or perhaps a density which has been the result of indexing of indexing, associations of associations (this later mostly applying to the way I compose poems). I reach my space of writing—my kitchen table, surrounded by a bay window presenting wide vistas of fields and skies (I can see storm fronts moving in from about ten miles away), most every day at five a.m. after a good night of sleep stoked previously by some reading—mostly philosophy from Pascal to Wittgenstein, as I find it often stokes the next day’s writing. After a first cup of coffee (one of three, cheap, strong Cuban), I put on some music—mostly modern composition (David Diamond, George Crumb, etc. ); I open either a 7 x 5” assignment notebook (for poetry), or a 6 x 9” Steno Book (Gregg ruled) for libretto and plays, and, using a black Ticonderoga No. 2 pencil, I begin. Mostly the poetry comes as a response to mining the previous night’s dream-stock. Working fits with enduring images and/or the crenulations of a dream, I quickly move to a tractor-beam of associations. Today, for example, somehow the image of souls, paired somehow with a sense of unknowing, which leads to the way to Meister Eckhart, which leads to Zen Buddhism, which leads to the paintings of insects, snails and flowers by the sixteenth-century Flemish painter Joris Hoefnagel to an image of pure iridescence. From this, the poem comes quickly. Immersing myself in these deposits of information creates an environment in which lines start to present themselves, and the shape of the work emerges. What is key for me about this sort of emotional, cerebral, visual and sonic architecture is the possibility connecting to others having both like and radically different experiences. The poem I produce at the beginning of this process becomes a central reference point. I keep it visible, attempting to memorize it, as I read it, sounding it aloud, which further helps to shape it to its completion. I’, often working on various projects at once: I am never at the same stage of planning/writing/editing on two or three pieces but seek out situations that enable me to be at different stages, resulting most often in a sense of complementary groups of work percolating simultaneously and productively. When I’m working on a libretto—usually following the day’s work on a poem—I work in the Steno Book, transferring each day’s work to my laptop, making corrections and initial re-writes. This has been my pattern for Brendan, Nosferatu, Caligari, Golem, Frankenstein, as well as current works in progress—Faust and Inferno. It’s a process that has a velocity and flow unlike my work in poetry; the call and response between characters animates the task. I’ve written these books and libretto as I continue to do with a long-term collaborator, composer David Esposito. Mostly I end these initial passes at work by nine or ten a.m., often returning throughout the day to continue as needs call. G. E. Schwartz, who has studied with Irish-American poet John Montague and Joseph Brodsky, was an original member of Solomons Ramada, as well as Faking Trains. He's the author of Only Others Are: Poems (Legible Press), Odd Fish (Argotist ebooks), World (Furniture Press), and Living In Tongues (Theenk/Loose Gravel Press).